Wilses gate 4 is located in an upcoming vibrant part in the heart of Oslo city center. The location has grown to be a popular hangout for its many restaurants and bars. Torggata, a nearby street is now reserved for pedestrians and bicycle riders. You can find everything from Starbucks coffee to bubble tea, from kebabs to fine dining, and from trendy fashion to a dedicated cap store. The street that used to be just another street har become a destination itself, as well a natural link between the trendy Grünerløkka and the vibrant Youngstorget. Norway’s house prices have accelerated dramatically in the past years. In Oslo the house prices skyrocketed by 17,48% inflation-adjusted during the year ti Q4 2016. Since then, prices has increased and the smaller apartments are over bid as first buyers can only afford them. 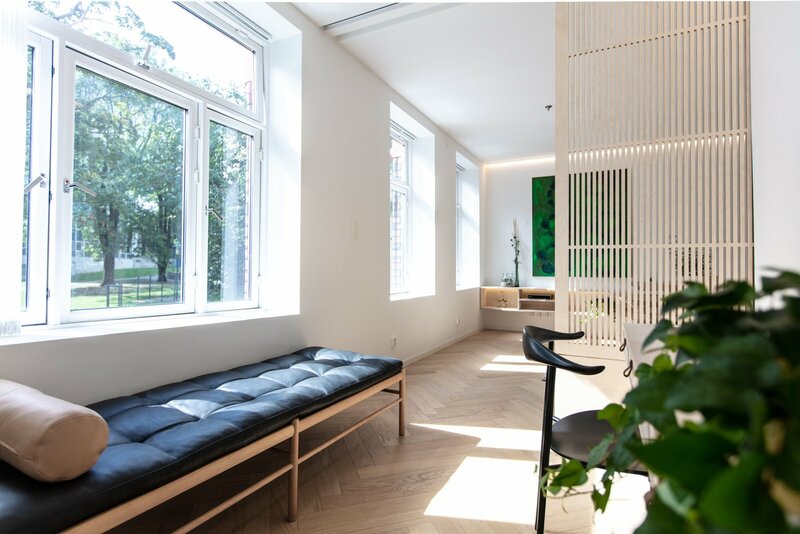 To make value of every sqm the team behind Wilses gate 4 want to challenge all the unpractical new builds and make highly functional and spacious apartments even so the space are small. We want to challenge the visual and quality perception in busy people living in urban cities. Instead of choosing plain new builds and be comfortable with that, we produce high quality homes. We strongly believe in the quality and easy living will affect people in a positive way. Owning less, have more time and focus on the important things in life. By introducing birch plywood and Japanese inspiration, we add simplicity and relaxation into people’s life. The apartment was an original 51-sqm 1-bedroom, and is now after a 2 years comprehensive renovation, transformed into a highly functional and spacious 2-bedroom apartment. 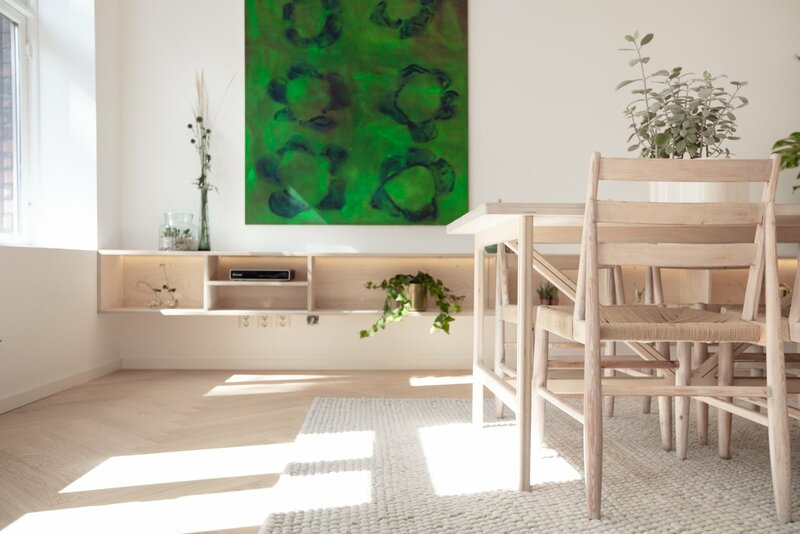 By adding custom-made furniture and sliding doors made of birch plywood, the owners has emphasized the Nordic interior style with a touch of Japanese simplicity to make a modern city home. The original plan is now re-arranged by an architect to be as functional as possible, and at the same time utilize the brightness from the many windows the apartment has. The Japanese inspired sliding door goes from floor to ceiling and function as a fully flexible room divider. The door has multiple functions, either to have a fully open living room or to keep privacy in in the guest room or while working. To hide the kitchen while cooking or hide the mess is also great on some occasions. The bathroom is kept neat and tidy, with bright and a tight look. The architect has made a niche for the washing machine, and dryer. A huge sliding door in same style as the living room enters the master bedroom, which was the kitchen before, and now turned into a functional bedroom with lots of wardrobe space and in the mid-section function as a path to the quiet balcony facing the backyard of the building. 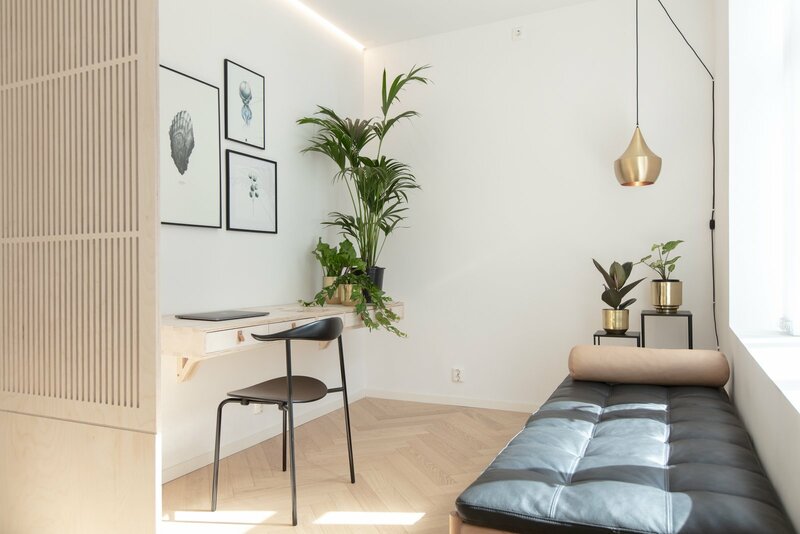 The common of all material used in the apartment is birch plywood which the owners has cut with CNC and handmade with details added such a brass and surfaced treated with natural furniture soap.